Google has released its latest user data for its Android Platform, which shows which version of Android mobile users are on, and it should come as no surprise that 0.4 percent of all Android users are on the latest version of Android, Android 2.3 Gingerbread. What is interesting is that only 51.8% percent of Android users are actually on the previous version, Android 2.2. 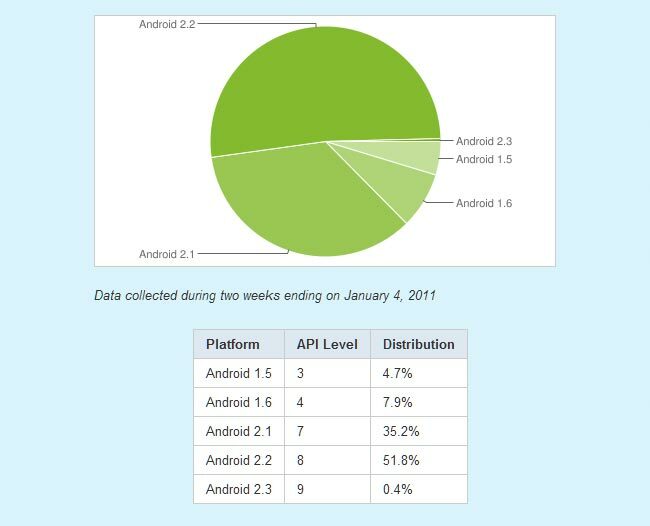 Froyo, whilst 35.2 percent of Android users are still on Android 2.1. We heard earlier today that one manufacturer is charging mobile carriers for Android version updates, and that particular smartphone, the Samsung Galaxy S which is a popular one is still on Android 2.1. Previous versions of Android below 2.1 seems to be getting a lower percentage each time, with just 7.9 percent of all Android users on Android 1.6 and 4.7 percent of users on Android 1.5. It will be interesting to see how the figures stand when Google releases the next version of Android, we suspect many Android smartphones will only have been upgraded to 2.2 by then and no doubt we will see an increase in Android 2.3 users. Google’s continues to face the problem of Android fragmentation, and with manufacturers like Samsung adding to the problem by charging carriers for Android updates this is something which is bound to continue in the future. You can see more details about the versions of Android being used over at the Android Developers Blog.